We always like to provide the very best in entertainment for your event, which is why we have added some new activities ready for 2012 events. The year 2012 will be a very big year for the events, with the biggest sporting event, The London Games being hosted in London and through the UK. For this reason we have expanded our product rance to include some very fun but skillful activities to test your skills and endurance. New activities available for hire include Batak Reaction Game, Giant Scalextric and Under Pressure Game. 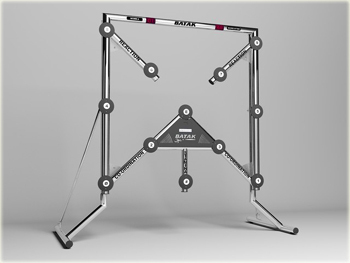 Batak Reaction Game is a challenging, quick paced game perfect testing your reaction times while having fun. The exciting game consists of twelve LED lights that light up one at a time. For more details about this activity visit our Batak Reaction Game activity page. Our Giant Garden Games are perfect for any event as they are suitable for all ages. The Garden Games include Giant Jenga, Giant Connect 4 (Mega 4 in a line) and Giant Noughts and Crosses. For more details about this activity visit our Giant Garden Games activity page. Giant Scalextric is a perfect activity for all ages. Scalextric has come a long way and with the introduction of Digital Scalextric. This Scalextric track allows up to six slot cars to race at one time on our multi lane racing circuit which is complete with pit lane. With fully computerised scoreboard and race control, many different game scenarios can be played and player must ensure they take a pit stop before they run out of fuel. For more details about this activity visit our Giant Scalextric Hire activity page. Under Pressure is an exciting inflatable game which can be played by two players or by two teams. This amazingly fun game involes skill, speed, timing, accuracy and dexterity. The idea of the game is to use the air from the funnels to move the ball along the game. The winner is the first person or team to move all five balls from one end of the game to the other. For more details about this activity visit our Under Pressure activity page.